This map of the British Isles is by Gerard De Jode. It dates from 1570 and was published in Antwerp where De Jode was a well established map seller. De Jode and Abraham Ortelius were cartographic rivals and although several of De Jode's maps are superior to those by Ortelius, De Jode's map of the British Isles is disappointing. 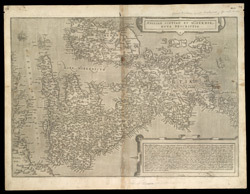 It is a direct copy of the outline of the British Isles shown by Gerard Mercator. An interesting difference is that De Jode omits the fictitious Lake Antre in Northern Island (is this same as Purgatory of St Patrick?) which was included by Mercator and Ortelius. A large text panel contains descriptive text that originally accompanied the 1546 Lily map. George Lily's map of the British Isles was much copied and was significant as it was the first separately-printed map of the whole of the British Isles and included many more place names and distinct topographical features with a remarkably accurate depiction of Scotland. This map is not the work of a skilled engraver, unlike some of those in De Jode's later atlas the Speculum Oris Terrarum which were engraved by the brothers Jan and Lucas van Deutecum. It is likely that this map of the British Isles was engraved by De Jode himself.